SpaceShipTwo explodes over the Mojave, CA during test flight. Update 3: The National Safety Transportation Board's investigation into the Virgin Galactic crash is just beginning, but a possible reason for the accident is already starting to form. While the incident analysis is ongoing, and could take months to complete, the question of pilot error is already being raised. This is due to the state of the wreckage on the ground, as SpaceShipTwo's engine and fuel tanks were found intact. Both ship components were found "with no sign of a fire or breach," which could rule out some possibilities. Furthermore, the video feed of the cockpit shows co-pilot Michael Alsbury activating the feathering system on SS2 before he was supposed to -- activating the system at Mach 1 instead of Mach 1.4. The feathering system brings the tail of SS2 up into a slowing position, which helps slow the ship as it prepares to descend. This early activation is not yet being pointed to as the cause of the accident, as the investigation is ongoing. Another aspect of the mission that will come under intense scrutiny is the new engine being used in a test flight for the first time. SS2's latest engine burns a new kind of fuel -- a type of nylon called polyamide -- instead of traditional kinds of liquid or solid rocket fuel. We will be sure to keep an eye on the investigation as it unfolds, and update here accordingly. Update 2: Both the injured and killed pilots have been officially identified. Michael Alsbury, 39, was killed in the test accident. Alsbury was a 14-year veteran of Scaled Composites, the subcontractor working with Virgin Galactic, where he served as a project engineer, and test pilot. The surviving pilot, who is currently in treatment, is 43-year-old Peter Siebold. Siebold is to undergo surgery later this evening. Update: The Kern County Sheriff's office has confirmed that the injured person is one of the two pilots on board Virgin Galactic's SpaceShipTwo. The injured pilot, who has suffered "moderate to major" injuries in the crash, was able to eject from the craft before it fell apart in the sky. Mojave, CA (where the test flight took place) is part of Kern County, which also includes Lancaster, and Bakersfield. Original Story: Reports are coming in, and Virgin Galactic has confirmed, that its SpaceShipTwo spacecraft exploded after suffering "a serious anomaly," during a test flight originating in Mojave, California. Witnesses on the ground say the explosion occurred shortly after the rocket on SpaceShipTwo was activated. Parabolicarc.com, which had reporters present during the test flight, has been detailing the crash account, including the news of at least one related death. Along with details of debris falling from the sky, @spacecom (parabolicarc's Twitter account) sent out the following: "Saw [one] of crash sites. Body still in seat." The Associated Press, and California Highway Patrol have confirmed there was one death, and one injury due to the accident. The injured person is now being airlifted to a hospital in Lancaster, CA. There is no information yet on the identity of the injured person, but SpaceShipTwo test flights typically involve two pilots controlling the spacecraft. UPDATE: Virgin Galactic's partner Scaled Composites conducted a powered test flight of SpaceShipTwo earlier today. During the test, the vehicle suffered a serious anomaly resulting in the loss of SpaceShipTwo. [White Knight Two] landed safely. Our first concern is the status of the pilots, which is unknown at this time. We will work closely with relevant authorities to determine the cause of this accident and provide updates ASAP. The statement does not directly address the reports of a killed SpaceShipTwo pilot, and we have reached out to Virgin Galactic directly for comment. The Virgin Galactic launch system is two-fold. One ship, called SpaceShipTwo (or SS2), is the craft that goes into the upper echelons of Earth's atmosphere. White Knight Two (WK2) carries SS2 up into the sky, where SS2 then detaches, activates its rocket, and blasts off into space. 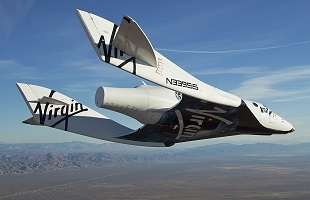 Scaled Composites, the contractor that builds WK2 for Virgin Galactic, was conducting today's ill-fated test flight. The flight was to be the first powered test flight (powering the rocket on in-flight) since January. The purpose of the test, while not confirmed by VG, could have been to test a new engine design. This is the second spacecraft explosion in three days, the first being the Orbital Sciences Antares rocket failure in Virginia earlier this week. The Antares explosion resulted in no loss of life, as the rocket was part of an unmanned flight to the International Space Station.